NOTE: Before selecting the proper spear length, you must first know which type of shaft your gun accepts (Euro cut or American cut). “Euro cut” spears are built for “Euro Trigger Mechanisms” and “American cut” spears are build for “American Trigger Mechanisms”. DO NOT use a Euro cut spear in an American trigger Mech. DO NOT use an American cut spear in a euro trigger mech. In determining the proper spear (with flopper) length for a railgun, it is quite easy. You simply add 40 cm to the length of the gun barrel. For example, a 100cm railgun, which has a 100cm barrel, would require a 140cm spear. In determining the proper spear (with threaded tip) length for a railgun, you again, add 40 cm to the length of the barrel of the gun. However, you then deduct 12 cm from that number to account for the length of the slip tip and adapter or the screw on tip that you will be using. For example, a 100 cm gun would require a spear that is 140cm long, minus 12 cm = 128 cm threaded spear. In determining the spear length for American Mechanism Gun (wood or hybrid), the length of the barrel is not used. Instead, the distance between the back of the trigger mechanism to the front of the gun is used for calculating spear length. This is because with wood guns and hybrids, some have longer “butts” (distance between back of trigger mech to the back of the gun) than others. There is no universal standard for selecting the proper spear length for an American Mechanism Speargun (hybrid gun or wood gun). Some guys like a short overhang of around 10 inches, while others like a longer overhang of up to 15”. The average appears to be around 12” of overhang. Step #2: Measure from this point to the front of the gun. Step #3: Then add approximately 12 inches to the previously obtained measurement. This will give you a suggested spear length with a 12 inch overhang. If you want a slightly shorter overhang, you can add less than 12 inches. If you want a longer overhang, you can add more then 12 inches. 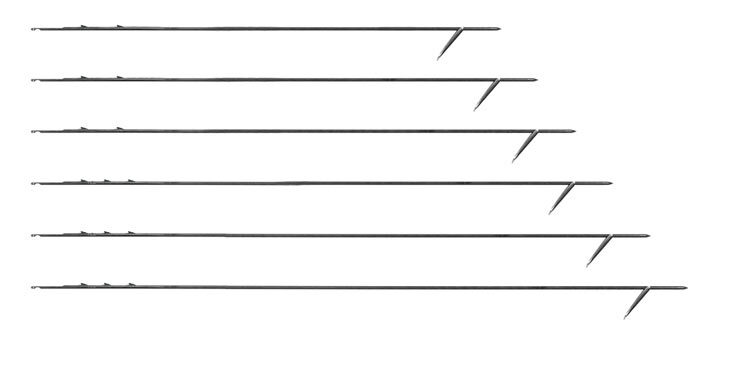 In selecting the proper length of a threaded spear (for slip tips), you will add only 6 inches of overhang instead of 12 inches to get a 12 inch overhang. This is because the slip tip (with the adapter) is normally around 6 inches long. So, the threaded spears are about 6 inches shorter than flopper spears. Example: A 58” threaded spear with a 6” slip tip (including adapter) makes for a 64” spear.